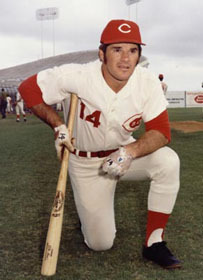 AKA Peter Edward Rose, Sr.
Has the record for most career hits of any baseball player in history. Served five months in jail for filing false tax statements, 1990. Has belatedly "come clean" about his gambling over baseball, though still ineligible for the Baseball Hall of Fame. Claimed in 2007 that he bet on the Reds to win every time they played.